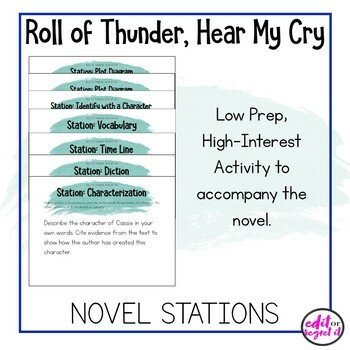 Designed for students to rotate through these novel based activities, with minimal preparation and carefully written instructions, your students will love this hands-on approach to learning. 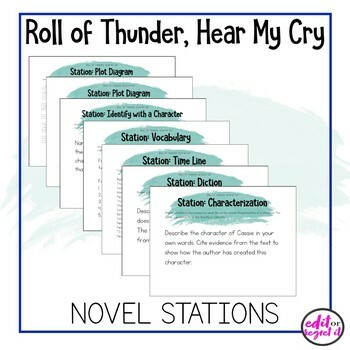 This download has six (6) different stations covering the following topics: characterization, diction, timeline, vocabulary (identifying unfamiliar words), identify with a character, and a plot diagram. 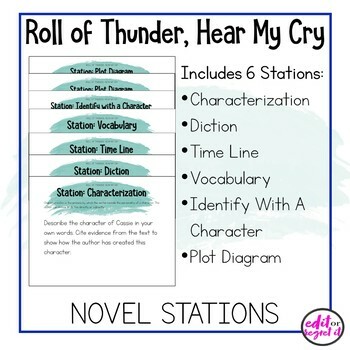 The timeline and plot diagram both have the "pieces" for students to cut out and put together to save time (and give them focus in the assignment). ❤️ Mildred Taylor Author Study Activity, Biography Worksheet WITH ANSWER KEY!